You guys are doing a great job there, storing old stuff adults can drag their kids to see. But many young ones don’t care. Imagine the carbon dioxide generated from all the dramatic sighs. If you combine the CO2 buildup contributed by your young visitors with that of the bloviators on Capitol Hill, you could argue Washington D.C. is ground-zero for climate change. However, it is not only the under-21 set that finds your product a tad dull. I have identified the culprit: your failure to keep pace with the latest photographic trends. These trends provide a certain change in perspective. Allow me to help. I have captured iconic scenes since before cameras were invented. Though I am not as famous as Ansel Adams or Diane Arbus, I have a certain contemporary sensibility that is lacking in their work. And in your exhibits. When Dorothea Lange took the famous “Migrant Mother” photograph nearly 80 years ago in California, I was there. After Dottie snapped her pic, I jumped in to take a much better one. 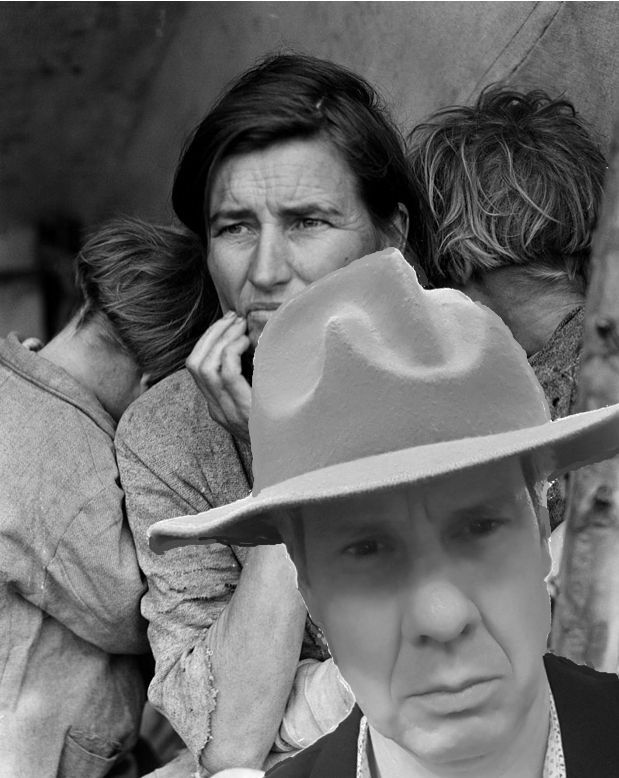 My photograph depicts the human effects of migration during the Depression, but includes a soupçon of egocentricity. Asking price: One selfie stick with aircraft-grade aluminum pole and built-in wired shutter. 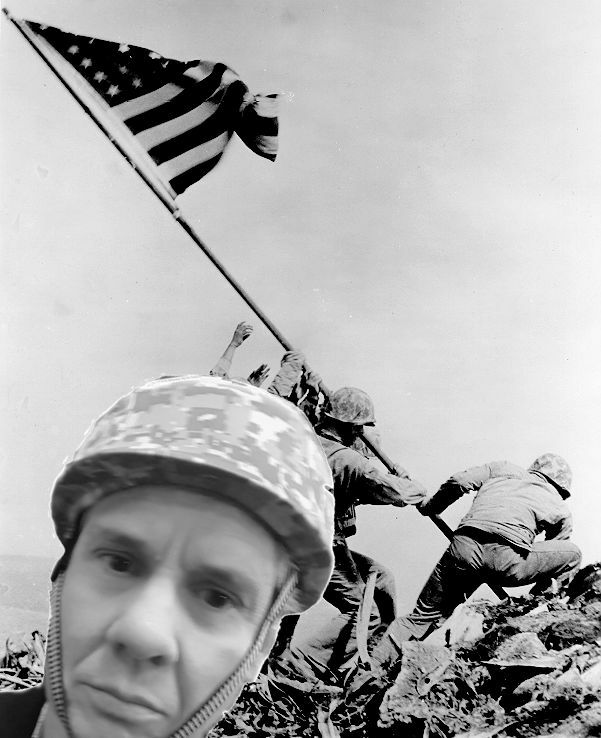 Joe Rosenthal’s 1945 Iwo Jima flag raising pic won the Pulitzer Prize for Photography. But do we know for certain Joe was actually there? Of course not, because he did not include himself in the photo. Major oversight coupled with outdated 20th century thinking. My photo is better, because it documents for posterity my bravery. Asking price: One authentic battle-used World War II helmet I’ll claim to have worn when I single-handedly captured an enemy platoon. Because you’re in the picture business, I’m sure you’re envious regarding the purported Billy the Kid tintype that recently came to light. It’s the one experts say is worth five million dollars and is only the second known image of the infamous bandit. However, there is a third photo. I was playing croquet with a few of my pals down in New Mexico when Billy and his gang showed up and asked to join us. I said why not, but I wanted to snap a pic first. Or, as we said in those days, “take a tinny.” Billy didn’t see the harm in it and suggested I be in the frame, too, because otherwise what good would the photo be. Technically, this image does not include Billy, because the sun was quite harsh that day and I wore my big hat. I inadvertently obscured my new chum. Therefore, I offer this photo exclusively to the Smithsonian for half the value of the other one: Just 2.5 million dollars. Also, enough mirrors to cover every wall in my house. By the way, Billy couldn’t hit a croquet peg to save his life. If your interests run older and more colorful, no problem. As I mentioned, I have been at this game a long time. I was strolling through the streets of Milan in the late 1400s, stopping occasionally to paint selfies of myself in front of old buildings, when I came across a guy named Leo painting a restaurant scene on the wall of a cafeteria. I was not impressed, because the scene reminded me of most parties I attended in college. (12 guys to every female.) More important, Leo’s mural lacked an essence of self-absorption that is critical in any modern masterpiece. I re-painted his scene to make it more marketable. I learned later I failed to paint the guy who was picking up the tab for the meal, but that’s secondary to making sure I was in the picture. Asking price: Photoshop lessons plus an even larger hat to contain my enormous head. Get with the times, Smithsonian. No photo can be any good if the taker is not also in the frame. A haunted man steps through the back door of a shop in a small town on a blistering August day. In a rampage that lasts less than sixty seconds, he kills six men and then himself.